Within a month of being sworn in to Tulane Law School’s Domestic Violence Clinic, third-year law student Jessica Greenberg (L ‘18) was already representing a client in a contested day-long trial. Greenberg's experience highlights a distinguishing feature of the Tulane Law School Domestic Violence Clinic – the clinic manages a steady drumbeat of emergency cases that are mixed in with complex lengthy litigation and appeals. In this context, students are in and out of the courtroom throughout the year, representing survivors of domestic violence, sexual assault, and stalking through a combination of emergency hearings, contested trials, pre-trial motions, discovery, depositions, and oral arguments. 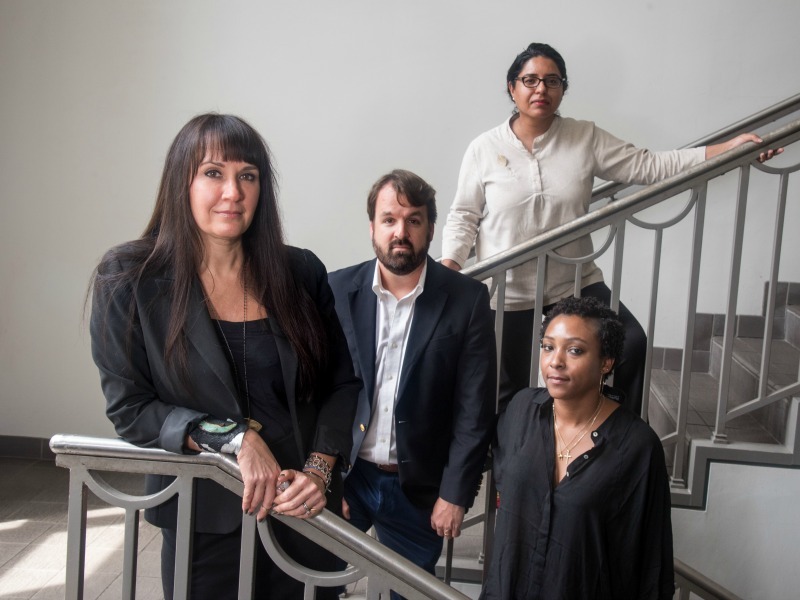 They do so under the intensive supervision of three full-time faculty members with national and international expertise in domestic violence litigation and advocacy. And although the clinic faculty are veteran litigators, they do not take center stage—students serve as “first chairs” in their cases, handling all aspects of a client-centered practice. Student attorneys in the Domestic Violence Clinic will also break new ground this fall, as the clinic expands the breadth and scope of its work on gender-based violence during a time when the global #metoo and #timesup movements have catapulted these issues into public consciousness. Under the leadership of Clinic Director Becki Kondkar, the clinic has been recently infused with significant new resources, through a combination of grants and alumni giving. It’s the beginning of a new era in a program that has provided civil legal services to victims since 2002. The Domestic Violence Clinic’s new design includes three projects that expand opportunities for its students. Through the Safe Homes Civil Litigation Project, a state-wide Domestic Violence Appeals Project, and the Women’s Prison Project for incarcerated survivors, students can litigate trials in civil district court, write and argue appeals in Louisiana’s appellate courts, handle clemency petitions on behalf of incarcerated abuse survivors, and explore law and policy issues affecting their clients. Students can now represent clients as part of any or all of these projects, helping prepare them to enter the legal profession with the technical, professional, and emotional competencies necessary to serve clients in an array of legal settings. The hallmark approach to these projects is what Kondkar calls “multi-dimensional lawyering.” Students learn to tackle client problems from a variety of angles, to examine the social and legal context in which they occur, and to advocate for clients through multiple legal processes. For a single clinic client, student attorneys may handle issues or litigation involving protective orders, child custody, support, and divorce, and they may also advocate for clients in related criminal justice proceedings, consumer law issues, public benefits, immigration, or housing. Farooq (L ‘04) joined the faculty in July 2018, after working most recently as a Rule of Law Officer for the United Nations Development Program in Myanmar. Also a veteran litigator with expertise in gender-based violence, criminal law, and appeals, Farooq brings a global perspective to the clinic. She has trained attorneys, judges, and court staff across the globe in places such as Tunisia, Pakistan, and Myanmar, and will enhance the clinic’s emerging work at the intersection of domestic violence and human rights. According to Kondkar, Farooq’s international perspective has already expanded the program’s capacity to engage students on matters affecting women across the globe. The Domestic Violence Clinic team is rounded out by its new community impact coordinator, Kesana Durand (L’09). Having worked locally on issues related to juvenile justice and education reform, Durand brings her own unique perspective to the Clinic’s work, drawing connections between domestic violence and other social justice issues that affect the clinic’s clients. “Working on a team that believes in multi-disciplinary approaches to serving clients is refreshing,” Durand said. In addition to her community engagement work, Durand is charged with finding ways to sustain the clinic’s expanded programs through continued external fundraising. Both Kondkar and Durand have anxiously followed recent delays in Congress’s re-authorization of the Violence Against Women Act. “It is wonderful to have grants that support this important work, and they have helped us grow our program. But in an ideal world, our funding would be more diverse, and less dependent on annual grant cycles,” said Kondkar. In the meantime, the team looks forward to what lies ahead for their students, who will join the legal community practice-ready and equipped with a global perspective on social justice. Already, program graduates have gone on to provide local and national leadership in domestic violence – working as prosecutors, defense attorneys, legal services lawyers, private practitioners, pro bono advocates, policy directors and advisors. Others have traveled the world as diplomats, worked for international NGO’s, or are stationed around the world as JAG officers – each taking with them a sophisticated perspective on gender-based violence. Recent graduate and corporate attorney, Chelsea Lawson (L ’17) reflected on the impact of her clinic experience. As yet further testament to the clinic’s impact, the Lutz Family Public Interest Fellowship for Children’s Welfare (a program dedicated to funding legal services for children and families), has awarded fellowships to five Domestic Violence Clinic alumni, enabling them to enter careers in public service to domestic violence survivors and their children.